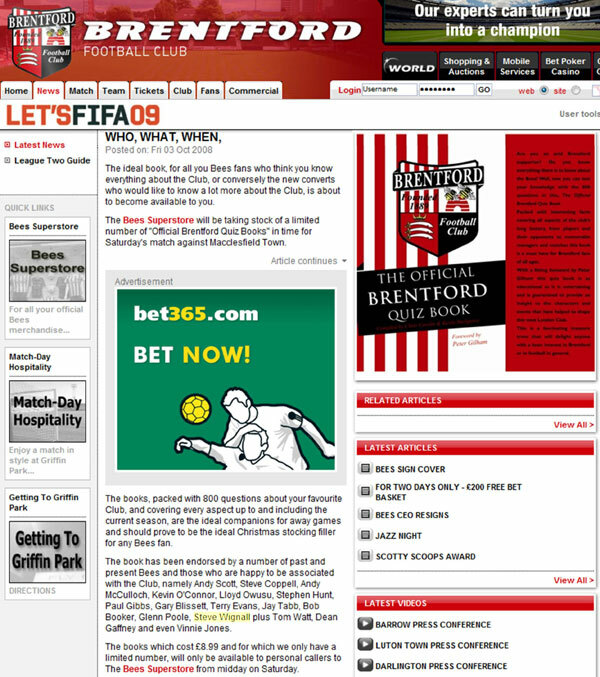 Brief Description: Are you an avid Brentford supporter? Do you know everything there is to know about the Bees? 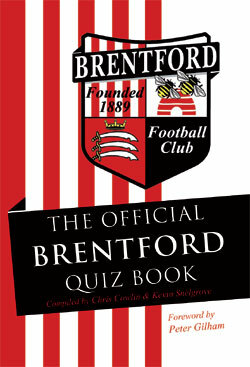 Well, now you can test your knowledge with the 800 questions in this, The Official Brentford Quiz Book. Packed with interesting facts covering all aspects of the club’s long history, from players and their opponents to memorable managers and matches this book is a must have for Brentford fans of all ages. With a fitting foreword by Peter Gilham this quiz book is as educational as it is entertaining and is guaranteed to provide an insight to the characters and events that have helped to shape this west London Club. This is a fascinating treasure trove that will delight anyone with a keen interest in Brentford or in football in general. Football is our nation’s favourite game. Football is everywhere, it pervades all walks of life. 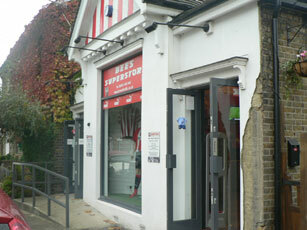 But however overbearing it may sometimes appear, it continues to be personal to each and every one of us Brentford Football Club is such a case, it is unique, as indeed may most clubs be to those who support them. But Brentford has a special something about it which may be difficult to describe to the lay man but is inborn in anyone who has ever been smitten by this west London club. Once bitten by these Bees there is no antidote. Surrounded by clubs whose aspirations are being aided and abetted by untold millions, this Club continues to survive and build for the future through the simple dedication of those who are the lifeblood of the game…the supporters. 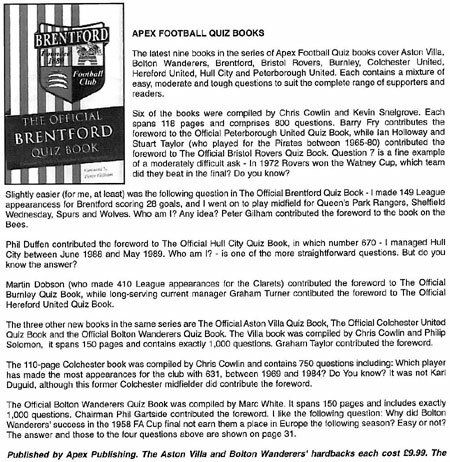 This book, through the simple use of questions and answers, will not only test your knowledge about Brentford but will also help and educate those who are not fully aware of the “who, what, when, why and how” that has shaped this great Club, and give them a better understanding of why supporting Brentford is more than just a way of life … it is for life! 800 questions on the Bees, ranging from easy to difficult – the whole family will enjoy this book. 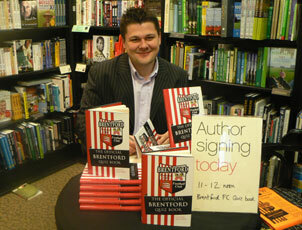 A perfect gift for any Brentford fan! 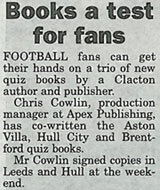 A true test for all Bees fans, fun for all the family. 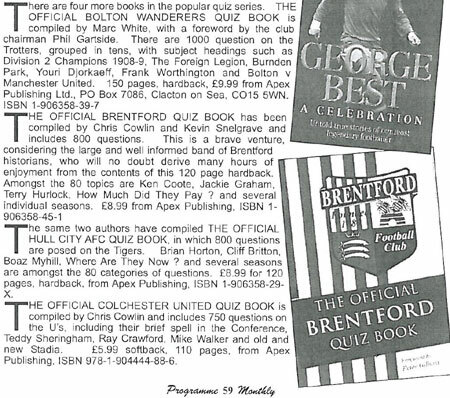 This quiz book will occupy the minds of anyone on a long trip and will thoroughly test Brentford fans, both young and old, on their knowledge of the past happenings at the Club. A wonderful set of questions, perfect for any Bees fan. Have as much fun with this book as I did with Brentford FC. A book that every Bees fan will not be able to put down. How much do you know about this great Club? This excellent book will help you to discover the answer to that question and to many more. (Photo: Compiler Kevin Snelgrove, Paul Gibbs and compiler Chris Cowlin). 800 questions on the Bees - what a test for even those people who think they know it all. This book has so much information in that teaches you a lot about the history of Brentford Football Club – I am sure you will have a lot of fun with this. Anyone who can answer this lot probably needs locking up! 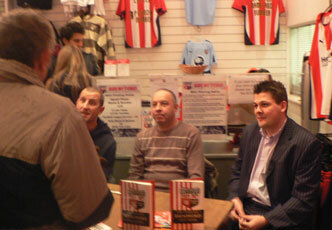 A book that every Bees fan will not be able to put down - an addictive read! 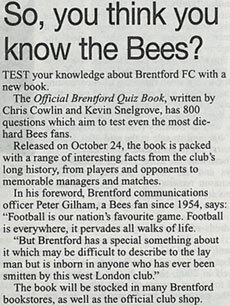 A true test for any Bees fan, with so many questions this is sure to keep you entertained for hours! 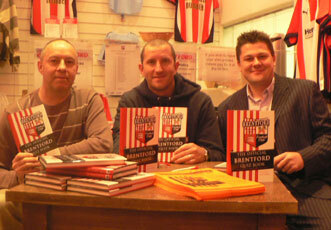 The variety of questions ensures that both young and old can enjoy the Brentford experience, past and present. There’s nothing football fans enjoy more than talking the game. 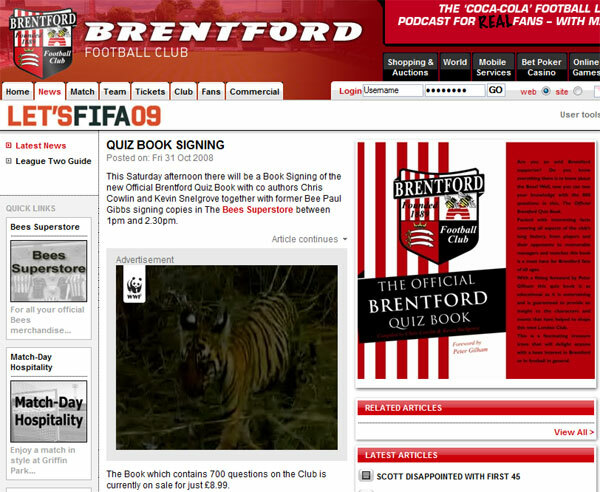 This could be the most enjoyable way to learn about your club…Brentford. This quiz book has it all, facts, figures and information about Brentford Football Club. WIN! 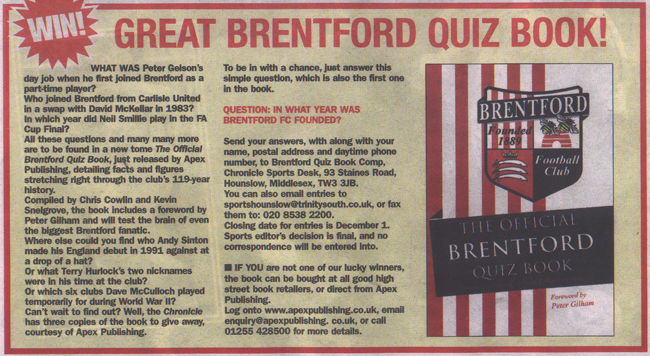 GREAT BRENTFORD QUIZ BOOK! SO, YOU THINK YOU KNOW THE BEES? This book brought back many memories and reminded me of some things which through time I had forgotten. 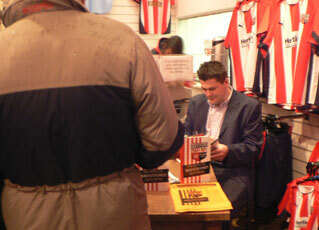 Chris Cowlin and Kevin Snelgrove signed copies of their book 'The Official Brentford Quiz Book' at Brentford Football Club, Griffin Park (Bees Superstore). They were joined by former player Paul Gibbs. (Photo left: Kevin Snelgrove, Paul Gibbs and Chris Cowlin). 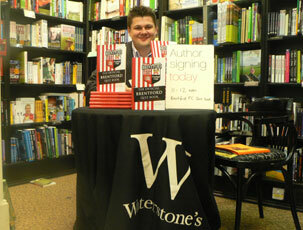 Chris Cowlin signed copies of his book 'The Official Brentford Quiz Book' at Waterstone's, Richmond. 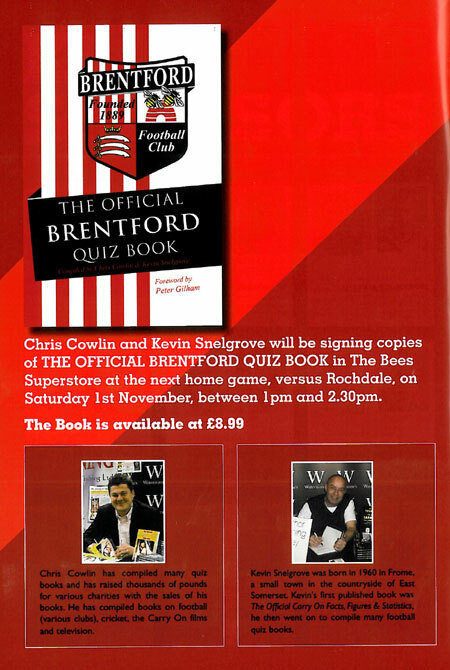 Chris Cowlin and Kevin Snelgrove signed copies of their book 'The Official Brentford Quiz Book' at Brentford Football Club, Griffin Park (Bees Superstore).